The temperature not long after the sun rose over Minneapolis on the morning of the winter solstice in 1989 was around zero degrees. 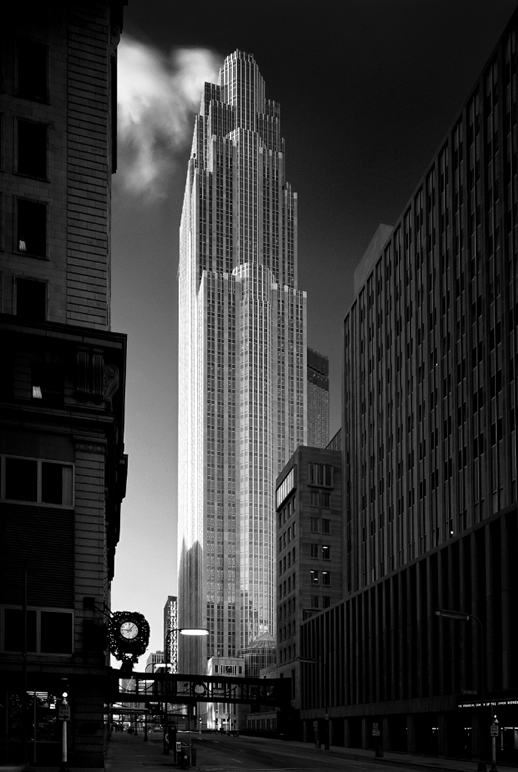 Those puffs of white you see at the top of the building in George Heinrich’s classic photograph of Cesar Pelli’s handsome Norwest Center (opposite) are not clouds but steam, venting from the building on a bitterly cold day. The cold that day penetrated to the bone, making it difficult to perform subtle adjustments on the 4 x 5 view camera—those slight tweaks to focus and the position of the bellows that make the difference between a snapshot and a fine, closely thought-out photograph. His tripod set on a spot staked out to catch the optimal few moments of light on Pelli’s great striated pillar of stone, Heinrich exposed nine sheets of film that morning—some color, some black and white, all of them (going by the position of the hands on the clock through the series) captured within the space of just a few minutes. The steam plume, so expressive in this exposure of the exhaled breath of a building, was quietly given a little more emphasis in the darkroom. Heinrich is a craftsman in the lineage of the great photographers of midcentury Modernism— Balthazar Korab, Ezra Stoller, and Julius Shulman—and he is full of respect for an even earlier generation of photographers who, for the sake of print quality, continued to shoot and print from glass-plate negatives (a photographic process used from before the Civil War) up through the 1940s. In his library is a portfolio— a lodestar, given to him by the late John Kammerdiener, a Minneapolis architectural photographer who worked in the 1920s—of contact prints made on fine rag paper from large glass-plate negatives, prints that in their texture, tonal range, acuity, and archival purity are equal, if not superior, to anything done today. Stock Photography of Minneapolis and St. Paul, Minnesota plus New York, Southwestern United States and South and Central America available upon request. Copyright@2018 George Heinrich All Rights Reserved.